Last Thursday (1st October) was a fantastic day for sailing. Horizon-to-horizon sunshine and the strength of the wind grew from hardly creating a ripple on the water at 8.30am to 20 knots by midday. Of course, being Chipstead Lake, the wind was gusty as well and shifting around between E and NNE. Quite a few WS Racers arrived early to make the most of their sailing time and practice on the water. But as the wind got stronger some decided to reef their sails (i.e. have a smaller sail surface area than normal) whilst others wanted to take on the wind. At 11.45 when most of the Racers were on shore, taking a breather and grabbing a bite to eat, they were encouraged to get back out on the water so that the Race could start at 12 noon. There were 9 entrants plus 1 volunteer, making a 7 strong 303 fleet, 2 for Liberty (3 minute delay) and 1 for Martin (8 minute delay). The course had been written up on the board by the clubhouse since 10am so some of the entrants had been able to sail round the course, from a Start Line between Buoy K and the eastern Pontoon, a beat up to Buoy D, a run down the lake to Buoy C and a fast reach back to Buoy K. The strength of the wind resulted in the 303 fleet being further than necessary from the Start line as the Start Whistle sounded, nevertheless most of the 303 fleet had started the race within a minute or two of the whistle and the first boats over the line (Kim, Bob, Steve and Fay) were making good progress on the upwind leg to the first Mark (Buoy D) before the back markers had started. Three minutes later Brian and Mike in their Liberties started chasing the 303 fleet whilst Malcolm Hill and his crew, Mike Coleman, had to remain patient for another 5 minutes due to the handicap system based on the respective PY (Portsmouth Yardstick) numbers of the 303 and the Martin, over a 40 minute race. The PY means that given a Pursuit Race lasting a specified time, different classes of dinghy can start at various intervals and all things being equal they should arrive at the finish line at the same time. This race showed the PY handicap for the Martin was pretty accurate, since although the leading 303s had completed nearly two laps BEFORE Malcolm Hill started in his Martin, the superior boat speed of the Martin gradually cut into the leads of the Liberty and 303 fleets and eventually on the final lap, Malcolm just passed Kim Sparkes, who had put all her skill and strength into the race, on the penultimate leg of the race to win by less than a minute. Brava to Kim for battling from the front and Bravo to Malcolm for keeping his cool and battling his way up all the way from a long way back!! As this part of the storyline unfolded, the rest of the WS Racers were discovering the difference of sailing with and without reefed sails. Although having a reef means that you may not be sailing as fast as you might downwind and when reaching, it does mean that the wind is less likely to knock you off your course and create difficulties during the up wind legs. However, Mike in his unreefed Liberty (and even after a few more minutes delay whilst he had his jib-boom replaced just after the Start Whistle which meant he was quite quickly overhauled by Malcolm in his Martin) was able to gradually sail up the fleet to finish some distance behind Kim. What might have happened if he had not had a jib boom-malfunction? The schematic below shows how steadily Lisa, and her crew Helen, sailed to take a very well-earned (considering the tough conditions) 4th place. This was an excellent precursor to the award by Steve Thomas (WS Trustee and Session Manager) to Lisa Holland of her RYA Silver Certificate and Badge. Brava Lisa!! 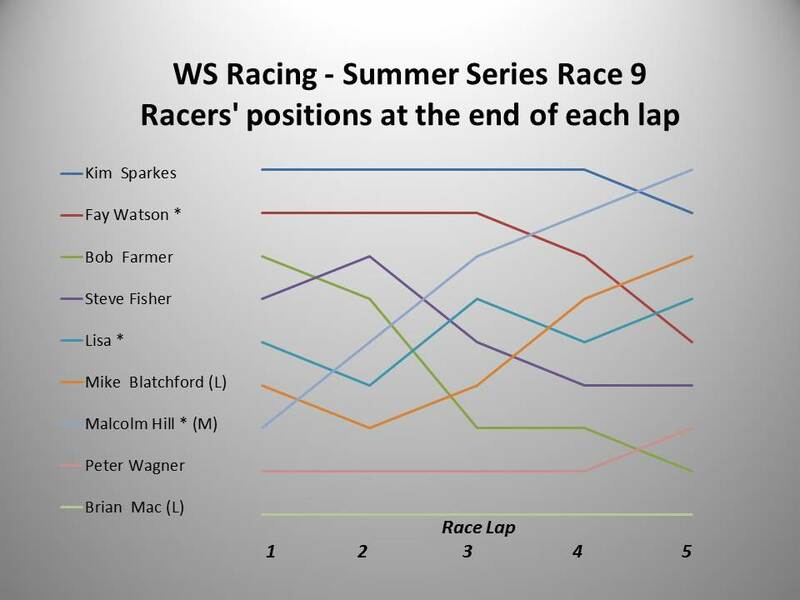 The remaining WS Racers all had to work extremely hard to complete the race and did so despite the tough conditions. 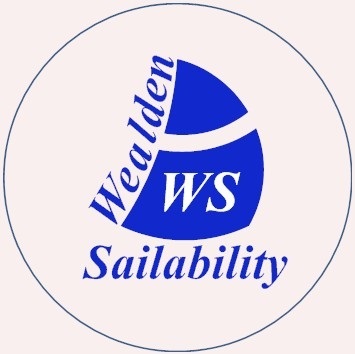 I know because I heard a comment at lunch, “At one stage it was so difficult out there, I was going to quit!” Well that Racer didn’t quit and to all of us involved with WS that speaks volumes of the character of all our clients. Well done to everybody who raced last Thursday!